Herman Wouk has the rare gift of the natural story teller. 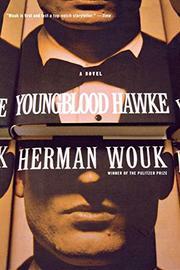 Youngblood Hawke carries one in tumultuous crisis after crisis through its 900 odd pages. That one resists the flood is of secondary importance. But that one finds it hard to accept the central character is a defect that this reader cannot ignore. Hawke is a rough-hewn Kentucky egocentric, convinced that he has written a masterpiece which is only the beginning; that he will cut a wide swathe across the whole of literary America. And this he does, against almost insuperable odds. He is incredibly naive in many directions:- the victim of a rich older woman's passion, a credulous- but never venal- fool in the clutches of a smiling small-time operator, an idiot when it comes to tax matters, a man ridden by his emotions, unable- it seems- to achieve happiness with the one right woman for him, and scarred through life by his mother's lust for money. He makes unbelievable fortunes- books, movies, plays, and so on; and loses them on a grand scale. And in the end, when security is within his grasp, he burns out his life on the altar of a sort of basic integrity. The scene shifts from New York to Kentucky coal mining country, to Hollywood, to Europe's playgrounds, even to Peru. And always the rewards of success elude our hero, and even his lust is sated and leaves him destroyed and unsatisfied. Certain odd style tricks (Hawke's lapses into phonetic Southern dialect patterns, for example) fail to provide the color required. Wouk is at his best in the story pace -- in his minor characters -- and at his most meretricious in the sordid behind the scenes pictures of the publishing world, the theatre world, and the world of operators. Slated for Book-of-the-Month, this is guaranteed to hit the jackpot. But it won't gain the identification stamp that made Marjorie Morningstar every Marjorie's story; nor the concentrated drama inherent in The Caine Mutiny.